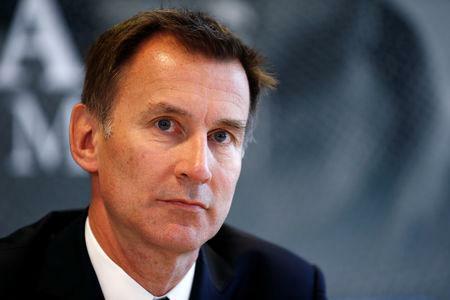 LONDON (Reuters) - Talks between the British government and the opposition Labour Party to find consensus over a Brexit plan are more constructive than people think, Britain's Foreign Secretary Jeremy Hunt said on Monday. "Talks we are having with Labour are detailed and I think more constructive than people have thought," Hunt told BBC radio. "They are more detailed and more constructive than people had been expecting on both sides. But we don't know if they are going to work." Meetings between ministers and their opposite numbers from Labour are due to continue this week, Cabinet Office minister David Lidington said on Sunday.